This SATB a capella arrangement of “Heavy Is Our Savior’s Cross” from Dr. R.C. Sproul’s new sacred music project, Glory to the Holy One features lyrics drawn from Scripture and a lifetime of theological reflection. 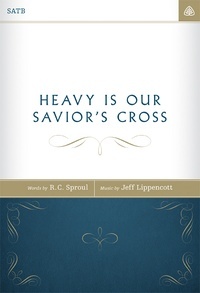 Glory to the Holy One is a collection of beautiful new hymns written by Dr. Sproul, wedded with soaring melodies written by award-winning composer, Jeff Lippencott. This new project provides the church with an offering of that which is good, true, and beautiful in the Christian faith. Browse all of the available sheet music from Glory to the Holy One.